Ever since reports emerged that Shah Rukh Khan’s big ’90s hit Darr would be rebooted as a web series, we’ve been waiting to see how it turns out. Turns out, our wait wasn’t a long one as Y-Films (the youth films division wing of YRF) released a teaser-trailer forDarr 2.0, as the rebooted series is being called, on their YouTube channel on Tuesday, 30 August, night. The teaser, which is about a minute-and-a-half long starts off innocuously enough: lots and lots of photos and messages from people’s social media accounts. In fact, Y-Films had asked fans to send across snapshots of their happiest moments that they’d shared on social media (Facebook/Instagram posts) with the production house, stating that they might be included as part of an upcoming project, without giving away too many details. It is these fan-sent images that have been presented as a collage by Y-Films at the start of the Darr 2.0 teaser. At a time when so much of your life is online, how do you know who is accessing these details? Do you have any idea of just how many people are accessing the parts of your life that you have put out for public consumption? And what if one among those who was following your every post was obsessed with you? A stalker? Darr 2.0 is about obsession in the age of social media. When even regular people would confess to a bit of social media ‘stalking’ when it comes to friends, enemies, prospective dates/bosses, even acquaintances, what about those with a little bit more — shall we say motivation — to track down every bit of information about yourself that you’ve put out online? In Darr, Shah Rukh Khan, Juhi Chawla and Sunny Deol played Rahul, Kiran and Sunil — Rahul’s obsessed with Kiran, who in turn is in love with, and marries, Sunil. 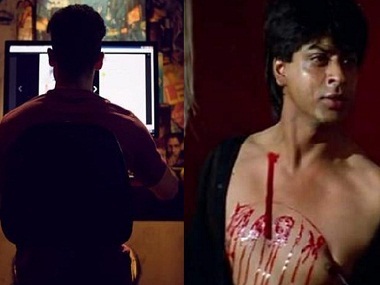 But if Darr had Shah Rukh’s character go to disturbing, and then dangerous lengths to get the object of his obsession, Darr 2.0 carries the methods of the stalker into the present day. The teaser for instance, depicts a boy sitting in his room, scrolling through the endless social media feeds of the girl he’s obsessed with, saving images, cropping her boyfriend out of pictures. He then utters Shah Rukh’s iconic line from Darr: “I love you K..K..Kiran”. The teaser, while short, reveals a tremendous amount of detailing. The character of this Rahul is shown in the posters on his wall (although we aren’t entirely sure if Burlesque should have been the film whose poster was chosen), the artefacts on his shelves (did we spot an fsociety mask in one of the frames? ), the gloomy cast of his room and even the logo on his T-shirt (which could be the Comedian’s badge from Alan Moore’s Watchmen). The message is pretty clear — this character is one firmly rooted in the digital age, and all its attendant aspects, including a frightening (for his victim) mastery over social media. Darr 2.0 will be released as a five-part miniseries. Will it match up to the original film?